In The Cost of Being a Girl: Working Teens and the Origins of the Gender Wage Gap, Yasemin Besen-Cassino contributes to understandings of pay inequality by showing how the gender wage gap is experienced by the youngest members of society. This nuanced study both reveals and challenges the intersecting elements of workplace culture that enable gendered inequalities to exist, and persist, from adolescence, writes Katelan Dunn. 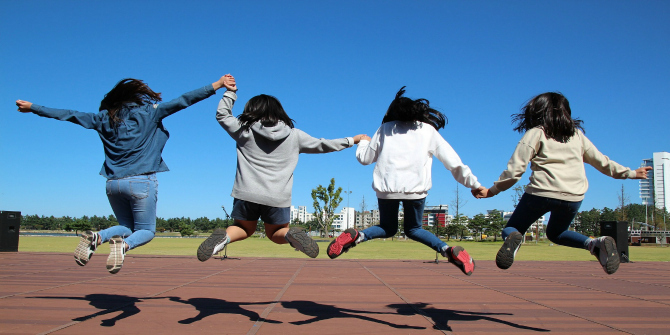 The Cost of Being a Girl: Working Teens and the Origins of the Gender Wage Gap. Yasemin Besen-Cassino. Temple University Press. 2018. 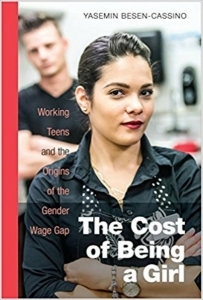 The Cost of Being a Girl: Working Teens and the Origins of the Gender Wage Gap, written by Yasemin Besen-Cassino, is a timely addition to the current discourse surrounding gender equality and, more specifically, pay equity. As recent movements such as #metoo and #timesup have become part of our current social and cultural landscape, the conversation around the wage gap is contributing to this burgeoning conversation on equality and gender. While research and data have long indicated the pay disparity between men and women’s work, women seem to be more mobilised than ever to protest this as a collective unit. According to the Bureau of Labour Statistics, a woman working full-time in the public sphere makes 82 cents for every dollar earned by their male counterparts. While this is an obvious improvement since women earned an average of 72 cents in 1990 (Wade and Ferree 2015), Besen-Cassino reminds us that this is due to deindustrialization and the subsequent decline in men’s wages. Thus, despite women’s increased post-secondary enrolment and contributions to the workplace, pay inequalities between men and women persist, and when it comes to closing the gender pay gap, the rate of progress has been and remains stagnant. As a persistent problem in our labour market and in the lives of women, and one which can cause significant long-term effects including economic instability and poverty, it is imperative that the gender wage gap be further examined. So, why do women get paid less than men? This is the main research question Besen-Cassino seeks to answer in her book. When it comes to examining and attempting to explain this gap, research studies have focused predominantly on adult employment, covering topics such as the impact of marriage, the existence of a motherhood penalty, the balance of work and familial obligations, the separation of the public and private spheres, salary negotiations and gendered expectations. Yet, this approach assumes that the gender wage gap only exists, and persists, when post-secondary education is completed and full-time employment in the public sphere as an adult commences. In fact, as Besen-Cassino articulates: ‘if our society wants to eliminate the pay gap, it needs to understand how it begins’ (2). Her book suggests that some of the gendered inequalities in the workplace are first faced by the youngest workers in society, with the emergence of a gender wage gap among girls from the age of twelve. The Cost of Being a Girl is organised into five chapters, exploring everything from the origins of the gender wage gap; gender differences in pay among freelance workers such as babysitters; gender inequality in retail and service-sector jobs; intersectionality and work outcomes; and a final chapter exploring short- versus long-term effects of work experience with a focus on projections about the future of the youth labour force and gender pay gap. Besen-Cassino uses a mixed method approach, utilising the National Longitudinal Survey of Youth (NLSY97) and the World Values Survey (WVS). Both are utilised to measure the short- and long-term effects of working as a young person, in addition to comparing male and female youth’s work values, motivations and aspirations and the outcomes of these on wages. 70 face-to-face qualitative interviews with young women between 18 and 24 working in freelance and retail/service sector jobs are also conducted. These capture their subjective, lived experiences and add a humanistic element to the research design. So what explains the emergence and persistence of a gender wage gap? Besen-Cassino notes a few things here. First, while girls and boys tend to find themselves initially engaging in freelance work, we see gender differences at play: girls are predominantly concentrated in jobs that pay less, such as babysitting, while boys pursue freelance work that pays more, including snow removal and yard work. In situations where boys do have babysitting jobs, they are ‘seen as more entrepreneurial, and they receive higher pay. They are also not expected to take on other household tasks, such as doing house chores, cooking, or running errands, but rather are treated more professionally’ (23). girls […] are more likely to be denied the raise and are characterized as manipulative. They are asked to show care to get the job; however, even caring young women are denied the raise because wage negotiation is seen as a non-caring act (23). This may explain why women are so reluctant to do so later in their adult careers. Furthermore, because freelance jobs such as babysitting are particularly concentrated among teenage girls and young women, they are unable to compete with their male counterparts, who are more likely to move into formal jobs in the paid public sphere when they become available to them. This, coupled with the reality that ‘because of personal contact and informal ties, many young women who babysit end up not being able to leave’, puts young girls and women at a disadvantage. Additionally, the ‘cost’ of being a girl is not only financial; it is also psychological. When teenage girls work in retail jobs, they not only make lower wages, lack benefits and have limited promotion opportunities, but are also subjected to unattainable beauty ideals vis-a-vis an ‘aesthetic labour’ requirement, which dictates that workers need to look good and sound right (Nickson and Warhurst, 2001). As a result, Besen-Cassino finds that such workers, who are predominantly young women, suffer from body image issues. This takes its toll: coupled with an emotional labour requirement whereby workers in service-sector and retail jobs are expected or asked to spend more time at their place of employment without compensation in order to help others, it has serious emotional, physical and psychological ramifications. While affluent white women are sought after, lower-income women of colour have a much harder time finding jobs, take longer to find jobs, are often shut out of the workforce, and often settle for lower-paying fast-food jobs, resulting in a wider wage gap (24). Ultimately, all of these early inequalities translate into greater ones in later life for women: the risk of falling into poverty becomes a very real possibility if women lack a living wage and earning power, particularly if they have dependents and do not have a partner. Economic instability can also place women in potentially dangerous circumstances if they are in abusive, violent relationships, and it impacts their ability to save for retirement. One of the most dramatic social changes of our generation has been an increase in the percentage of working women in the public sphere. Despite this, the failure of employers and governments to provide equal pay and adequate parental leave policies leaves women vulnerable and disadvantaged. While research on pay equity and the gender wage gap has persisted over the last few decades, with data consistently revealing that women are paid less than their male counterparts, very little has been done towards closing it. We can’t be naive to think that equal pay is something that can be addressed once. It is ongoing and must be monitored at every level and echelon of an organisation. The general consensus is that the gender wage gap is complex and requires a more nuanced view: this is where Belsen-Cassino’s research comes in. Not only does she recognise the existence of a gender wage gap between boys and girls as young as 12, she also challenges us to critically examine management and workplace culture that serves to socialise youth into existing (gender) inequalities in the workplace. When it comes to women’s wage inequality and their experience of poverty, the gender pay gap as a social and economic problem is one we cannot stop investigating, challenging and researching. The Cost of Being a Girl is not only a study into the perplexing and complex world of the gender wage gap, but it also reminds us that we have to remain cognisant of the many factors that can contribute to pay inequity that extend beyond unequal pay, including unconscious bias in hiring practices, overt/covert discrimination in promotion practices and an overall resistance to diversity and inclusivity.